5 Reel, 20 Payline video slot with features such as Tumbling Reels, Scatter and Wild symbols, Tumbling Treasures Bonus Feature. Denominations from 1.00 up to 5.00 per line bet, wager up to 5 coins per payline. The maximum bet amount is 500.00 per spin. This Dragons Wild replaces other symbols to form winning combinations. The Wild does not replace the Bonus symbol and does not activate the Tumbling Treasures Bonus Feature game. The Bonus Scatter may be scattered anywhere on the reels to form winning combinations, but 3 or more Bonus Scatters must appear on an active line. 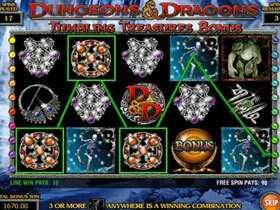 3 Bonus Scatters anywhere on Reels 1, 2, and 3 on an active line will activate the Tumbling Treasures Bonus Feature game. This is a unique feature - when landing a winning combination all the symbols forming that combination will disappear after the winning spin and more symbols ‘Tumble’ from the top of each reel. This can result in multiple wins from a single spin! When activating the Tumbling Treasures Bonus Feature, 6 Free Spins will be awarded. This feature can be re-triggered multiple times. The Bonus Feature will continue until no spins remain, or until 300 Free Spins have been played. The 1st Episode of the Dungeons and Dragons Saga. 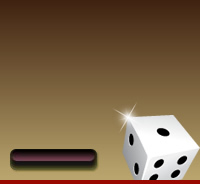 Get a minimum of 3 Dice to receive between 5 and 10 Free Spins with a multiplier from 1x and 3x. Diamond Queen is an IGT Video slot with a Free Spins Bonus, Scatter and Wild Symbols, Stacked Symbols and Locked Wild Reels.